Here is a collection of everyday text messages, greetings, quotes and SMS that you can send to friends and family to greet and encourage them in the morning and let them know you care for them. A simple every text message can brighten their mood and make them appreciate your thoughtfulness. 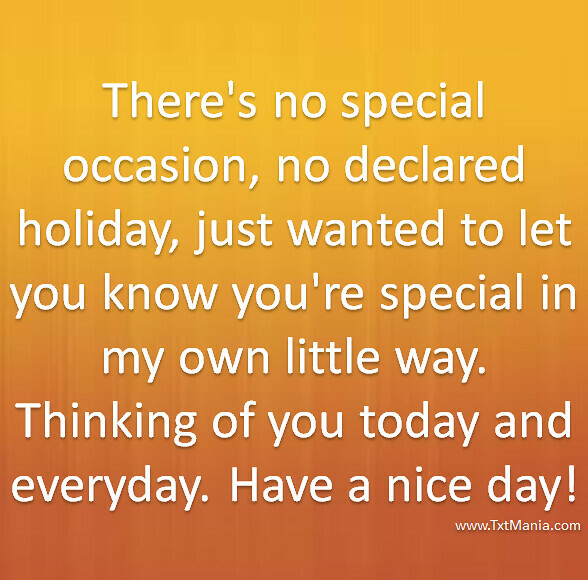 There's no special occasion, no declared holiday, just wanted to let you know you're special in my own little way. Thinking of you today and everyday. Have a nice day! Dear Lord, I seek Your guidance today for everything that I do. A blessed morning to all! People come and go in a lifetime but somewhere along the way you meet that special someone who makes you feel complete. Enjoy this wonderful day with a deep understanding of God's goodness. Exhale all your fears and worries then smile and say:" Thank you Lord for another day". Treasure the gift of family for they have been entrusted by God for you to love. Have a wonderful day. You can't always take matters into your own hands when you are going through a struggle in life. Sometimes you have to put your problems in God hands. You can't fix everything by yourself. Understand how beautifully God has added one more day in your life – not because you need it, but because someone else needs you. God can do the most amazing things, at d most unexpected times, thru d most unlikely sources, by the most unusual means, to bless us in the most delightful ways. Goodm0rning:) Have a peaceful en blessed day. Peace of mind is the greatest asset we can have for a healthy and happy living. Wishing you a relaxed mind, peaceful soul, joyful spirit and a heart full of love. Treasure the gift of self for you are so beautiful in the eyes of God and wealthy beyond imagination, for you are blessed! Have a wonderful day. Good Morning have a great day ahead. We're Blessed 🙂 Thank you LORD. No matter how good or bad you think life is, wake up each day and be thankful for life. Someone somewhere else is fighting to survive. Good morning ! Life is a road full of twists and turns, learn to enjoy the ride no matter how bumpy it is. For in every twist and turn, a blessing is always given in return . Let my prayer be the key to open your day… May the Lord touch your life with joy, bless your heart with love and comfort your soul with peace. Smile and stay happy because God is always there to give you a perfect touch! Gracefilled morning!